We’d love your help. Let us know what’s wrong with this preview of Type Matters! by Jim Williams. 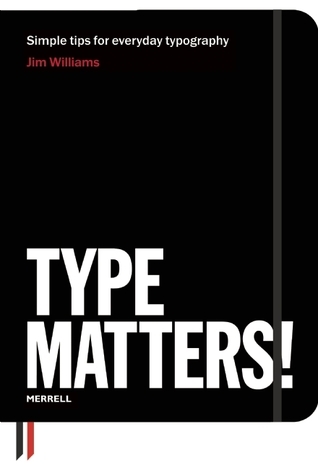 To ask other readers questions about Type Matters!, please sign up. Be the first to ask a question about Type Matters! Type Matters! was recommended on Facebook by one of my old college design instructors, so I picked it up. Although there are many competing typography basics books, I think this wonderfully fills a void in typographic education, reminding me of a cross between Ellon Lupton's fun and friendly Thinking With Type and Robert Bringhurst's dense and thorough The Elements of Typographic Style. Williams manages to explain most of the key concepts in typography with brevity and beauty, giving the reader a Type Matters! was recommended on Facebook by one of my old college design instructors, so I picked it up. Although there are many competing typography basics books, I think this wonderfully fills a void in typographic education, reminding me of a cross between Ellon Lupton's fun and friendly Thinking With Type and Robert Bringhurst's dense and thorough The Elements of Typographic Style. 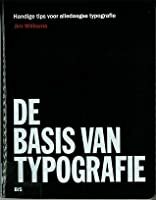 Williams manages to explain most of the key concepts in typography with brevity and beauty, giving the reader a base understanding of typography very quickly. There are not real-world examples like are prominent in Lupton's book, and there is not the weighty seriousness of Bringhurst's book either — it's a nice in-between. The book itself is gorgeously designed in a conservative color palette of reds and blacks, printed on uncoated paper, and set mostly in large Garamond Pro. It's a short book, but in that small amount of space it does a delightful job of summarizing the core aspects of typography. It's also absolutely stunning. Well worth picking up if this is a topic you're interested in understanding, although likely of less worth to experts. It's a very practical and useful introduction to typography. Anyone who isn't a trained graphic designer but does some creative work or text editing either as a hobby or as a favor to others should have read this first. I sure wished I had come across this book much earlier! Too bad that there are still some errors in the translation in an otherwise very nicely produced book. Perfect for a refresher in typography basics. I learned a few new things, but mainly this book serves as a good reference book to find information quickly. The book is well-made and I enjoy leaving it out! Reading books to become a better designer, this one was recommended many people. And I have been designing things for some time, reminded myself old stuff with a different perspective on the experience I gained and learned a couple of new things. Glad to have it in my library. Excellent explanations, examples, and grounding. A good book, with basics of typography. Not for designers, for people who type. Great reference for beginners, but only scratches the surface of type. I learn new things everyday and today I learnt that there’s a thing called ‘Diphthongs’. I initially bought this book for the sake for letterings improvement, but it turned out that this book is nowhere near lettering. It’s helpful in editorial and book design, though. There were some things I knew, some things I didn't. I think it's a very useful book on a long run, where I can also come back and look at and it could still be helpful. But overall, I still was expecting MORE. A very elementary book on typography, but very attractively designed and sturdily constructed book. If you are interested in learning some basics of type on your computer, this book would be an excellent start. But if you have dealt with type for some time or have already read comparable books, such as Erik Spiekermann's "Stop Stealing Sheep" then this book will probably not sustain your interest, short as it is. A little basic, but a very well illustrated review, and a book I might point someone to if they needed to polish their type skills. I would probably suggest Ellen Lupton's book, Thinking With Type, before this one, though, because it goes into everything in a way that helps a typographer make good decisions. Type Matters, in comparison to Lupton's book, could be considered more of a concise reference book. Simple, straightforward (I know, I know, what trite words), and beautiful reference for designing with typography. If you are a just-give-me-the-strategy type person and prefer it in a concise (rudimentary), visual package—as a gorgeous tactile object to boot—get your hands on this guide right here! A fantastic book to keep by the desk. This is really more of a reference book, but it is something I can see adding to my library. There are so many things in here that I have forgotten over the years that are essential to good typography and even though I am now an engraver, they apply to any work with type. Very clear examples that would be useful to the novice or the old pro. Appropriate for quick reference but for a more substantial examination of typography I'd suggest looking elsewhere. Thinking with Type is a good entry point. That said it's still a quality book with some nice examples of good and bad typesetting. A good gift book for someone just getting into the arena of newsletter or book publishing with everything to learn about typography. Lots of basics covered quickly. A mandatory book for beginners in typography. A good basic reference book for designers on how to use type correctly. Covers a pretty broad range of TYPE MATTERS, and they are always illustrated and explained very clearly and succinctly. Much red. Much black. Much type. Great book that explains the basics of typography. It is short, clear and easy to read. If you want to explore the world of typography in a fun and easy way then this will be a good start. Quick whirlwind tour of typographic basics. Succinct and efficient! I've been looking for a Typography book for beginners, and this is the one. Other than the fact that the book has all the basics clear and easy to understand, the design is beyond beautiful. Fun book to read. Covers basics of typography that, sadly, today's young art directors don't know or completely ignore. Great practical guide to the basics of typography. Very clear and easy to read. Beautifully presented book.